The first ten minutes of Alain Resnais' Hiroshima Mon Amour make it appear as if we're watching a documentary on the aftermath of the 1945 atomic bombing of that city, revealing the horrors of war on a gut wrenching level. We see mangled corpses, and victims so badly burned their bones were visible through their skin, images which serve as a brutal reminder of one of mankind's darkest hours. 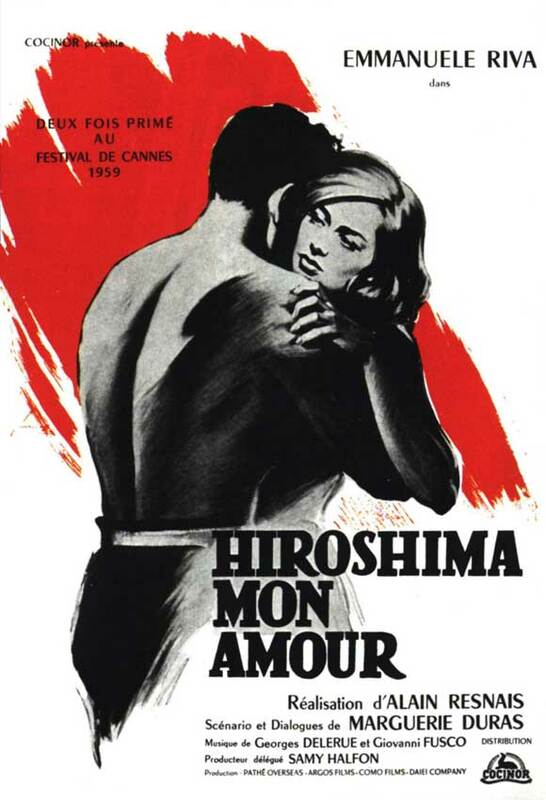 Yet Hiroshima Mon Amour bears witness to another tragedy of war: its memories. Through Resnais' clever use of flashbacks, coupled with his non-linear approach to telling this most unusual of love stories, we learn not all battle scars are on the surface. It’s 1959. A French actress named Elle (Emmanuelle Riva) is in Hiroshima, Japan filming an anti-war movie. She spends the night with Lui (Eiji Okada) a married Japanese architect who was off fighting when the bomb hit the city. As a result of their brief affair, Elle begins to reminisce about her own wartime experiences when, as a teenager in occupied France, she fell in love with a German officer (Bernard Fresson), a romance that ended tragically, and with her being branded a collaborator. Once again facing this bitter past, Elle must learn to accept her heartache and sorrow, lest she become yet another casualty of the war. Memory plays a central role in Hiroshima Mon Amour, both on a large scale (the city of Hiroshima) and a smaller one (Elle's affair with the German soldier). Images of Hiroshima as it looked immediately following the blast, with thousands of victims seeking shelter and entire blocks reduced to rubble, are interspersed with shots of the modern Hiroshima, the hustle and bustle of daily life returning to its streets. Where there was once carnage and chaos, there is now order and progress, and the bombing is but a distant, albeit painful memory. Despite having endured the worst of what war has to offer, Hiroshima has moved on. Elle believes she has also moved on. Having long forgotten her German lover, she now lives her life to the fullest, traveling around the world as a performer of some reputation. However, unlike Hiroshima, the human spirit cannot be rebuilt with brick and mortar, and while fourteen years may be enough time to reconstruct a city, its not nearly enough to rebuild the soul. Her dalliance with the architect has reminded the actress of her past, causing her to cling to her new love, as if doing so might somehow help her come to terms with the one she lost. Still, no matter how much Elle tries to escape the anguish, it's clear these memories will always remain.